Modern STL again joins the Architecture Section of the St. Louis Artists’ Guild to present a program on mid-century modern design. Cochran Gardens, designed by Hellmuth, Yamasaki & Leinweber and completed in 1953. 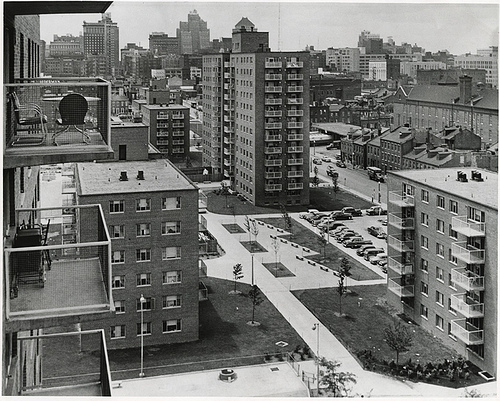 Architectural historians Michael Allen and Lynn Josse, both of Preservation Research Office, will provide an overview of the history and design of public housing in St. Louis city, from low-rise Carr Square Village in 1941 through the high-rise Arthur Blumeyer Homes in 1968. The talk will cover the contributions to local public housing architecture by major designers like Minoru Yamasaki, Gyo Obata, Joseph Murphy and others. With St. Louis’ two public towers both slated for demolition in the next two years, the talk will devote special attention to the development of high-rise housing forms and features at the Cochran Gardens and Pruitt-Igoe projects. Remaining public housing buildings at Carr Square and Clinton-Peabody have been heavily altered, meaning that the last intact buildings soon will fade to memory.